My plan to get to bed early last night was ruined when Epic Games dropped a Fortnite Battle Royale invite in my inbox. I had been itching to play it since I signed up for early access on Monday, so I ignored my body’s desperate calls for sleep and dived right in. I had already played Fortnite on PlayStation 4 and PC, so I had a good idea of what to expect with the mobile version. Epic promised it would deliver exactly the same experience. But I had no idea what the game would look like, or if it would even be worth playing with touch controls. I was blown away. Here are my first impressions of Fortnite on iOS. You start with nothing, so your first job is to collect the weapons, equipment, and resources you need to eliminate other players and stay alive. You’ll also need to avoid the storm that gradually makes the map smaller over time, forcing the remaining players closer together. Despite requiring an invite for now, Fortnite has already catapulted its way to the top of the App Store’s free games chart. It has a four-star rating and mostly positive reviews, and there’s plenty of love for it on social media. Does it deserve the hype? Epic delivered on its promise to bring the true Battle Royale experience to mobile. On iPhone and iPad, you get exactly the same 100-player game you’re used to playing on consoles. You battle it out on the same map with all of the same content. Because it’s the same game, you can even sync your progress between platforms. Sign into your Epic account and all your stats and everything you’ve unlocked elsewhere is ready and waiting for you on iOS. What’s more, you can even team up with your friends. By default, Fortnite matches mobile players with other mobile players, so if you’re playing solo, you won’t come up against someone with a controller or mouse. But you can join friends on PlayStation 4 or PC and play the same games as them if you want to. Sadly, I haven’t had the opportunity to test this yet — none of my friends were playing last night when I got my invite — so I can’t say how good cross-platform play is. But I can’t imagine mobile players will be winning too many gun fights against those on console or PC. There is no way to party chat yet, so you’ll have to find a workaround for that, but Epic says it’s coming. The other thing that’s missing for now is the ability to buy V-Bucks for your battle pass and other content, but again, Epic will add that later. Heading to certain death in Tilted Towers. 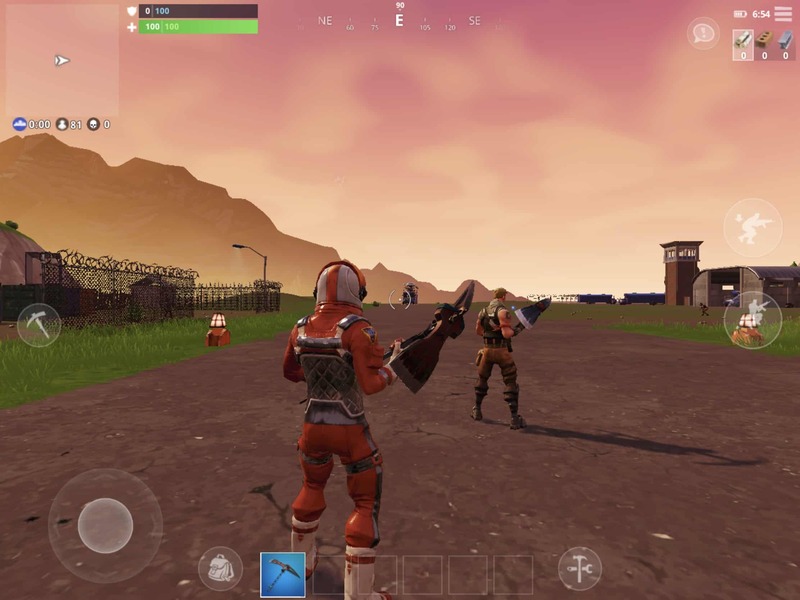 Epic has included indicators that help you locate nearby footsteps or chests in the mobile version of the game. They’re incredibly useful if you’re playing without sound, or there’s too much going on around you to hear the game properly. Obviously Fortnite doesn’t look quite as good on iPhone or iPad as it does on consoles or PC. Its textures are a little rough around the edges, and you don’t get the same draw distance — but that doesn’t mean it looks bad. 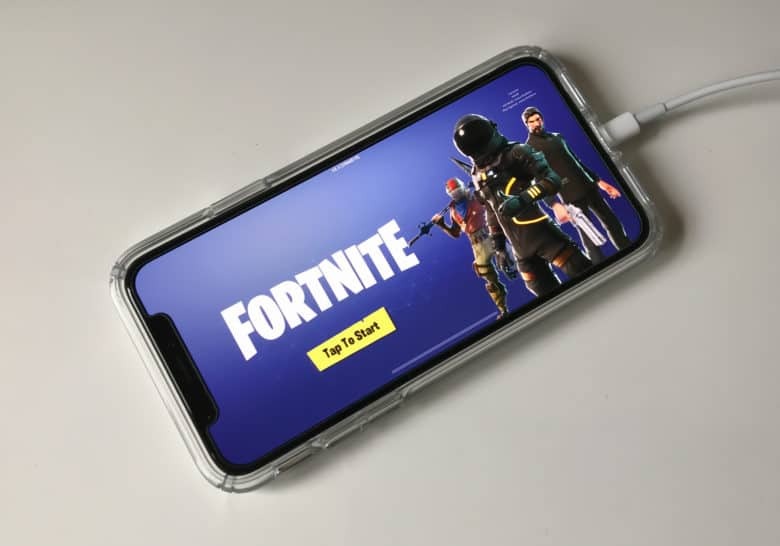 Because your iPhone’s screen is small, and because Fortnite’s stylized graphics look good even without too much detail, the visuals are great. The differences are more obvious on the iPad’s larger display, but it never looks bad. Fortnite performs well, too. You’re not going to get the same 60 frames-per-second you might be used to on PC, but you get enough to make the game perfectly playable. I haven’t noticed any significant frame drops that have made it difficult to play; it’s smooth, even when there’s a lot happening on screen. It’s a testament to how well the game has been built. It looks better on a smaller screen. You may find some things difficult to see, however. On an iPhone screen, enemies in the distance can sometimes appear as little more than a black dot. Even if you have a sniper rifle with plenty of zoom, it’s often easier to just move on and catch up with them later. As for connectivity, I couldn’t be more impressed so far. I have the same stable connection I’m used to when playing Fortnite. I rarely notice any lag, and I haven’t once been disconnected from a lobby after about seven hours of play. You might think playing a shooter with touch screen controls is crazy. I would normally agree with you. But Epic has done an excellent job of making Fortnite playable on a touchscreen, and once you’re used to it, it’s a lot of fun. It uses the same virtual control setup as other shooters on iOS. There’s a virtual stick for movement, you can drag your thumb just about anywhere to aim, and there are buttons for things like jumping, crouching, reloading, and switching between build and battle modes. Some things — like opening doors and picking up items — happen automatically in the mobile version of the game. However, you’ll have to tap a door to close it, and tap an item to swap it with something already in your inventory. The controls take some getting used to if you don’t play a lot of shooters on iOS, and you can’t expect the same kind of accuracy you get with a controller or mouse (if you do, you’re setting yourself up for disappointment). But they’re good enough. Just about everything is slower when you don’t have physical buttons to hit. You won’t be jumping around, snapping onto enemies, and rapidly building forts in the mobile game. You will also find switching weapons is difficult — especially on larger displays. It’s a little harder to play on iPad. I’ve found the game much easier to play on an iPhone X than a 10.5-inch iPad Pro. The bigger the screen, the further you have to reach to access the controls. There is no support for Bluetooth controllers for now, unfortunately, but it’s another thing that Epic has promised for later. I’ve been blown away by how good Fortnite is on mobile. I’m amazed Epic has been able to bring the game to iOS exactly as it is on consoles and PC, without watering it down. It’s quite incredible that we have the complete Battle Royale experience in our pockets to enjoy whenever and wherever we may be. Fortnite on iPhone is everything you hoped it would be. What’s great about Fortnite is that it doesn’t take itself too seriously. You can have casual fun with it even if you’re not that great at the game — especially if you play with friends. That’s what makes it so suitable for mobile, and why cross-platform play is possible. It doesn’t matter that some players are using controllers, some are using a keyboard and mouse, and others are using a touchscreen. It doesn’t matter that there isn’t always a level playing field. You’re going to have a great time with this game regardless. I’m incredibly excited for the future of Fortnite on mobile. It will be even better with controller support and party chat, but Epic has made a terrific start so far. I hope that this encourages other console game developers to consider iOS support. If you haven’t already, sign up for Fortnite early access today — and get playing as soon as you get your invite.